BreakThru Radio (BTR), the Internet's source for the World's Best Independent Music, announced yesterday that it will air an exclusive new specialty show from DJ Rachelandthecity, the "Ardent Sessions." This brand new show is particularly exciting, as it will feature performances from the best indie bands on the scene, live from Memphis' famed Ardent Studios. "Ardent Sessions" is the latest installment in the station's successful series of specialty shows. This exciting new playlist can be found only on http://www.breakthruradio.com. When bands step inside these walls they seem to definitely be able to feel it, and I have witnessed some incredible performances here. My goal is to be able to bring in younger, on-the-verge musicians, and help make them part of the story. BreakThru Radio (BTR), the Internet's source for the World's Best Independent Music, announced yesterday that it will air an exclusive new specialty show from DJ Rachelandthecity, the "Ardent Sessions." This brand new show is particularly exciting, as it will feature performances from the best indie bands on the scene, live from Memphis' famed Ardent Studios. "Ardent Sessions" is the latest installment in the station's successful series of specialty shows. This exciting new playlist can be found only on http://www.breakthruradio.com . The "Ardent Sessions" will air in conjunction with DJ Rachelandthecity's pick for BTR's Artist of the Week (AOTW). The premiere episode of the "Ardent Sessions" is an exclusive live in-studio performance of this week's AOTW, Bad Veins. Ardent Studios was founded in the late 1960s as a professional recording studio. During its golden era in the early 1970s, bands such as Led Zeppelin and Isaac Hayes recorded there. 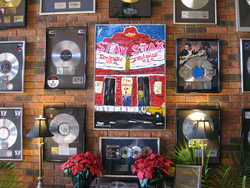 Now, artists such as Bob Dylan, ZZ Top, R.E.M., James Taylor, and The White Stripes have all recorded at Ardent Studios. Ardent Records is the studio's in-house label. "Ardent Studios is a really special place with an incredible history and vibe that's all its own," says DJ Rachelandthecity. "When bands step inside these walls they seem to definitely be able to feel it, and I have witnessed some incredible performances here. My goal is to be able to bring in younger, on-the-verge musicians, and help make them part of the story." With the addition of the "Ardent Sessions," BreakThru Radio further fulfills its goal of offering listeners complete on-demand, free programming that caters to whatever music niche in which their taste lies. Other BTR specialty shows include a folk show, a blues show, a heavy metal show, a dance music show and a hip-hop show. The "Ardent Sessions" premiered on BTR at noon yesterday and will be available in the station's archive and program guide, along with all of BTR's previous specialty programs. Listeners can tune in to hear DJ Rachelandthecity's special new show by visiting http://www.breakthruradio.com. BTR offers its listeners unlimited access to underground music, twenty-four hours a day, seven days a week, with a daily audience that includes more than two dozen countries. With its unique on-demand musical programming and focus on the best in new, independent music, it's no surprise the site has over 800,000 listeners daily. BTR can be heard on http://www.breakthruradio.com and http://www.NYTrack.com , New York's only website dedicated to the tri-state high school track community, thus reaching over 5 million high school students.